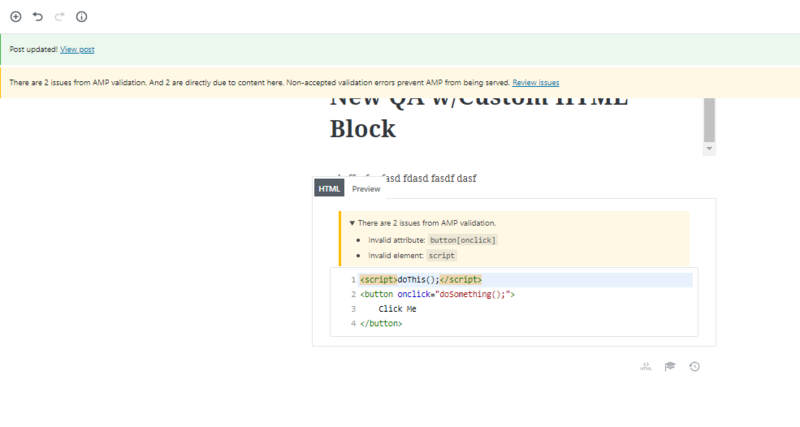 Add source comments around each Gutenberg block to track validation errors. Show validation status in editor after saving post. @kienstra feel free to pick this up from me. Thanks, @westonruter! It'll be great to work on this PR. If it's alright, tomorrow is probably the earliest I could get to it. I'm working on #1018 now. There is a bug with how Mustache replacements are being done which is corrupting the JSON in the block attributes. I'm working on a fix for that. Not a blocker for work being done on this. Rebased to include test page generated from #1018. Former head was 4a10ee4. // Inject rendered inner blocks before closing tag of outer block (or at end of string if no closing). @todo Confirm approach here. Let's not merge this as part of 0.7 since nested blocks are still in flux. Revert commit that removed REST API logic. as it wasn't needed for 0.7.
but not the wp-cron logic. Prototype asynchronous notices for blocks. The POST to the REST API in the JS file doesn't work yet. But this is a prototype of a way to display notices for each block, async. The UX would be like that in the previous PR #902. As Weston mentioned earlier, edit() is synchronous. And REST requests to validate content could delay it. Display a notice, based on the state of isValidAMP. The REST API request will update the state. @kienstra Here's an idea: what if we piggy-backed on the autosave functionality to incorporate the validation results? This could avoid the need to trigger an update when changing each block. We would be piggy-backing on the autosave interval. Upon saving draft we'll want to do the loopback request to get the full validation results anyway and display them in a notification. (Also, a block may enqueue scripts which would need to be caught but process_markup does not currently do that since it does not do wp_head or wp_footer. ) The results after this save we'll want to add to the blocks. So in addition to there being a validation message at the top, there should also be the specific validation errors added to their respective individual blocks inside so that users know which ones specifically are problematic. In short, I think perhaps this REST API endpoint should not be used, but rather a new REST field should be added to the existing post/page endpoints. When a POST/PUT request is made to create/update a post, this can trigger the same loopback request we're doing during save_post now, and then the array of validation errors could be returned as the contents of the field for the client to then display in the notification error and with each block. This could be done both during autosave and regular save requests. Thanks, that's a good idea to make a request to get the validation results on autosaving the post. The block edit() functions can fire a few times a second, so it was going to be hard to hook into those or componentDidMount(). I'll look at how we might display individual block notices when the page autosaves. So far, it looks setting the state of the AMPNotice component from outside the block might be hard. But there's probably another approach. So far, it looks setting the state of the AMPNotice component from outside the block might be hard. But there's probably another approach. I think that it shouldn't actually be part of the state then in this case. Instead the AMP validation results should be stored in the store that then sends the data down as props. So then you just update the store with the validation results, and then the edit function for a block can determine (somehow) which validation errors are relevant to itself and then display them. Thanks, that looks like a better approach. Rever commit 27e8b, which added REST API endpoint. 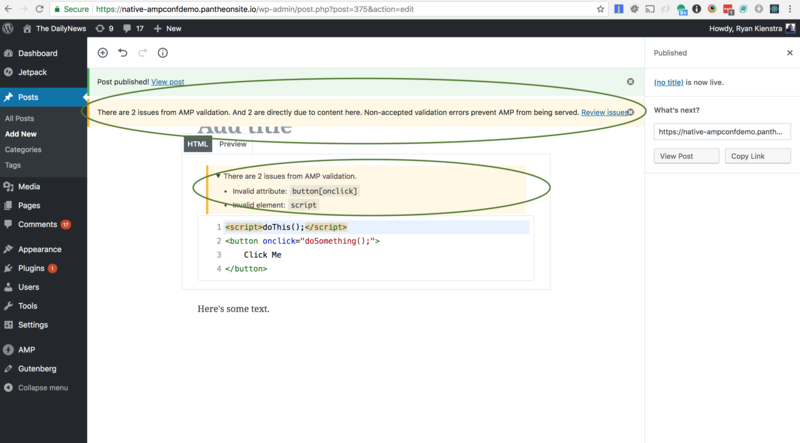 Add amp_validation field to REST API response. @todo: implement the output callback. This will enable displaying notices in blocks. Output validation errors in REST API response. @todo: we might not always want to output this. It's mainly useful in the Gutenberg editor. * @return array|null $validation_data Validation data if it's available, or null. Excellent re-use of this function. One key thing is that instead of $post_data['link'] it should do amp_get_permalink( $post_data['id'] ) so that it can work in paired mode. Good idea, @westonruter. This commit abstracts that snippet above into get_existing_validation_errors(), and reuses it here. If there are no existing errors, it validates the front-end. The only issue is that this delays the response if it validates several posts. When ! amp_is_canonical() then this should be the REST object types for all post types that have amp post type support. Otherwise, it should be added for all post types which have the editor post type support. Thanks, @westonruter. This commit implements that, and updates the tests. ES6 classes aren't going to work in IE11. Thanks, @westonruter. This commit removes the ES6 class. We should eliminate jQuery as being a dependency for this script. Extending Gutenberg should be jQuery-free. Thanks, @westonruter. This commit removes the jQuery dependency. Remove jQuery dependency and ES6 class. we can't use ES6 classes in IE11. in how it displays notices for validation errors. So remove almost all of the existing logic. Change which post types have the added field. it will be all posts with 'editor' support. Otherwise, all REST objects that have 'amp' support. @kienstra this is now unblocked and ready for review/merge. The latest state of master in Gutenberg works with this PR (so first do git pull; npm install; npm run build for that plugin). 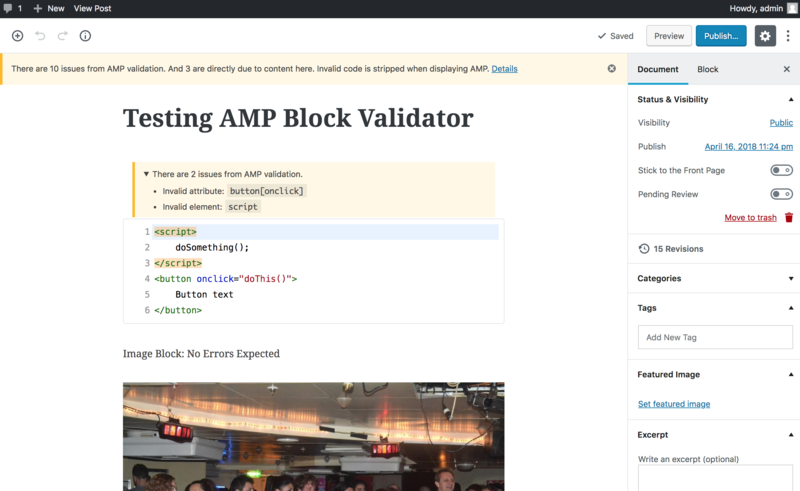 There will be more work to do on it of course, but the initial Gutenberg block validation seems important to get merged to start testing and using. Warning: Failed prop type: You provided a value prop to a form field without an onChange handler. This will render a read-only field. If the field should be mutable use defaultValue. Otherwise, set either onChange or readOnly. It's nice how the notice at the top of the editor says "But none are directly due to content here." And as expected, there was no block validation error on the page created by the WP-CLI script create-gutenberg-test-post.php. Good idea to use wp.data.subscribe(). 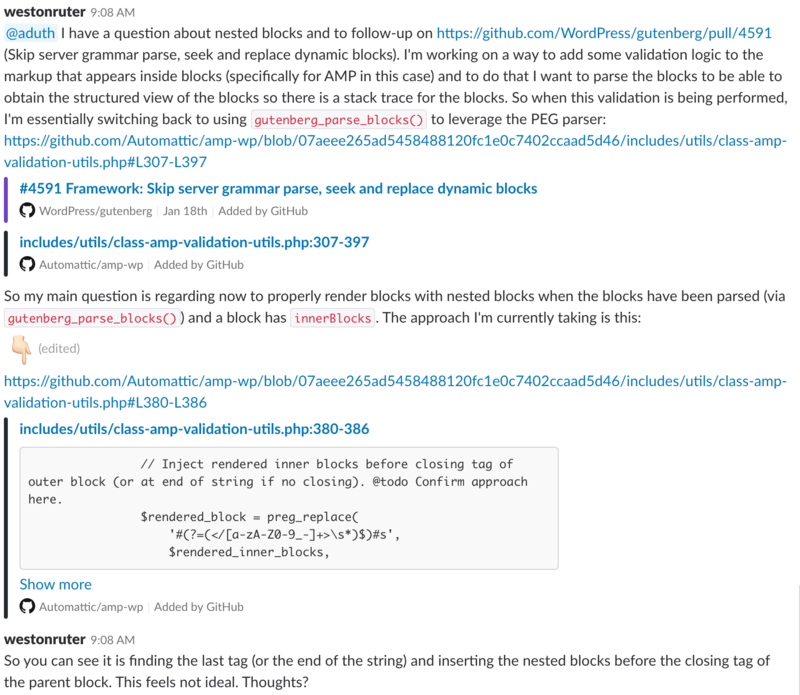 // Clear out block validation errors in case the block sand errors cannot be aligned. Nice use of _n() to make the message clearer. Good idea to run this at the priority of $do_blocks_priority - 1. This doesn't look to do any harm, but is there a reason to unset() this? Maybe to clarify that it's not used in the function. It's to prevent PhpStorm from flagging an unused function argument. The UX would be like that in the previous PR ampproject#902. 7. Expected: clicking "Review issues" in the top notice leads to a page "Invalid AMP Page (URL)"
Thanks for testing this. Could you please retest this to ensure there wasn't a regression, using the test steps above? Also, could you please test for edge cases by creating several blocks, moving and duplicating blocks, and other combinations?